Easter Sunday kicks off on the mild side. The south wind we saw yesterday carries over into the day and even increases this afternoon. Windy is the forecast for Easter, with south winds 15-25 mph. Gusts could run upward of 30. The wind does help us out some though. 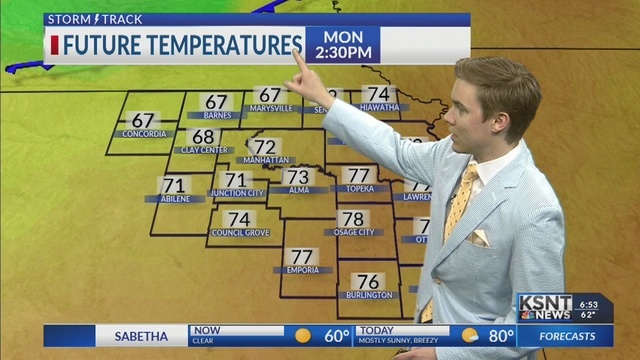 Warm air is thrust into northeast Kansas, so highs this afternoon top out in the low to mid 80s! We are also looking at a mostly sunny day, with a few more clouds rolling in later from the west. We could also see a few showers and storms carry over from central Kansas tonight. General arrival time for these would be after the sun has set, and likely when everyone is in bed. These showers should wrap up by daybreak on our Monday. Monday will be only slightly cooler, with highs in the mid 70s. A cold front will push through the area late on Monday. This could bring in some showers in the early morning hours of our Tuesday and will drop lows into the mid 40s again. Tuesday afternoon, we could see the return of enough moisture to have a better chance for scattered showers across the area. As we head into the second half of the week, a clearing set up takes over northeast Kansas with the help of a high pressure system. We also will see high temperatures rebounding toward 80 by Saturday.